More songs by these blind war veterans are available at the bottom of this page. During the early 1980’s while working at St Dunstan’s Ovingdean I wrote this poem. A helping hand to secure. See humour carrying them along. Their brave fight-the battle is won. During my time at St Dunstan’s I was deeply moved by the bravery of those I cared for. Every day was a challenge yet humour really did carry them along. One memory I’ll share today was my dancing lessons with Elmer Richards..
Elmer was blinded in the First World War, he had, I remember really soft hands and a beautiful almost porcelain complexion, with a warm gentle humorous face. Elmer liked to dance at the tea dances held in the afternoons. I’d never learnt to Waltz so watched on. I remember one day while walking along the promenade from The Brighton Pier to Ovingdean, a walk Elmer liked to do whenever he could. 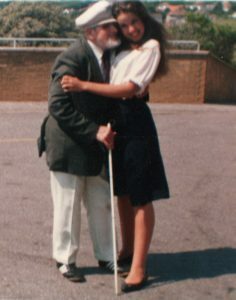 Elmer decided to teach me to dance, there and then – he couldn’t see the folk watching as they passed by. I remember laughing as he took hold of me and swirled me into a waltz. Elmer taught me, one two three, one two three, back, to one side then forward, something like that. On most of our walks along the prom Elmer would dance. I expect people got used to seeing a man with a white stick and hat swirling around a young lady. I remember the day I danced at my first tea dance, in my uniform. One St Dunstener I remember remarked,” where did you learn to dance? your quite good”. Elmer also taught me to play bowls which he loved, a great way to spend a rainy day. I remember he brought me a pair of white Daps in Woolworths. as I’d said in passing that the walking was wearing out my shoes. Elmer had never heard plimsoles called Daps. It’s a Somerset saying! Elmer loved it when I told him how smart he looked in his white bowls uniform which he wore for his matches. Dear Elmer, what a lovely old friend he was.